Gwen Stacy was the first true love of Peter Parker’s life. Love interests have come before and since, but there can be no doubt, Gwen was the first and the best. 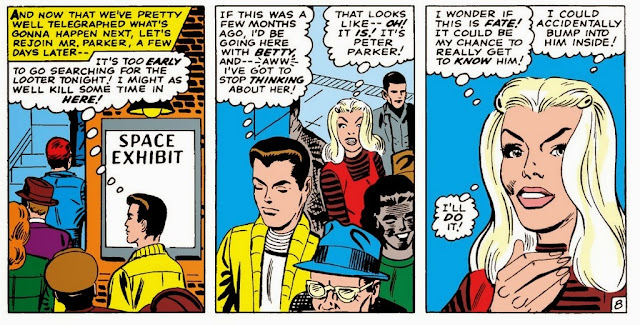 Betty Brant may have been the literal first girlfriend, but that relationship never progressed beyond a grade school crush. Liz Allan was always embroiled in a variety of ulterior motives. Many would argue the merits of Mary Jane Watson, having been married to Spider-Man for twenty years in real time. Carlie Cooper, despite what some naysayers would wish, has joined the pantheon of the many loves of Spider-Man. Comic book continuity is a tricky thing. At many times a wonderful storytelling tool, and just as often an albatross that drags everything down. The problem with the history of a comic book character is that it shouldn’t be all inclusive, but many fans like to treat it as such. Not every comic ever published needs to count. I share the sentiments of Mr Shooter, and I include the stuff I enjoy, the stuff that can’t be ignored, and then disregard the rest. It doesn’t all fit, because it’s impossible to make it all fit. 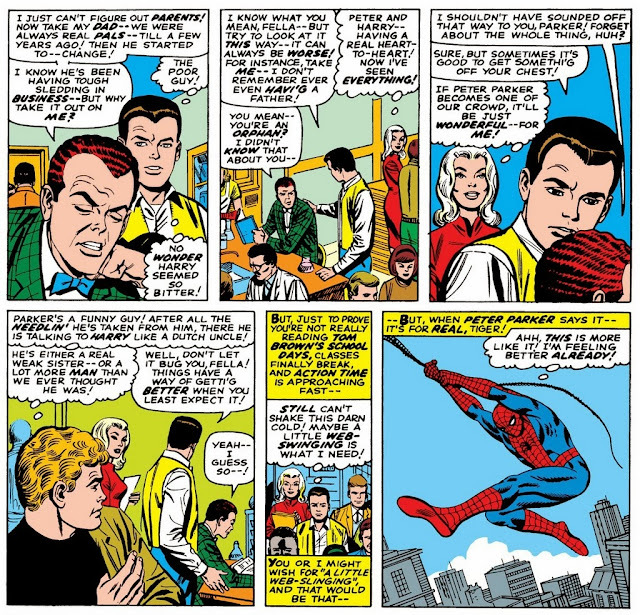 Thousands of different writers and artists have worked on a character on the level of Spider-Man. They can all approximate a similar take, but it’s all going to be different, and it’s not all going to be good, despite the skills of the creators involved. There are just as many fans that like to reference panel five of page six of issue number whatever as incontrovertible proof that a character can or can’t do something. Never mind that there may be a panel somewhere else that completely contradicts that. It’s all relative, and it should all be relative to each reader’s personal continuity. Spider-Man, as a character, has had his ups and downs, but I feel is pretty consistently depicted throughout the years. Scrape away all the topical references of any era, the presidents, the music, and the fact that an open-air radiation experiment probably wouldn’t happen at any point in the past ten years, on the sliding time scale. Peter Parker is relatively the same as a character. He’s evolved and grown (some argue he doesn’t) but he’s still recognizable. The biggest differences you can see between “puppeteers” is in the handling of the supporting cast, I believe. That’s where the biggest changes often are. 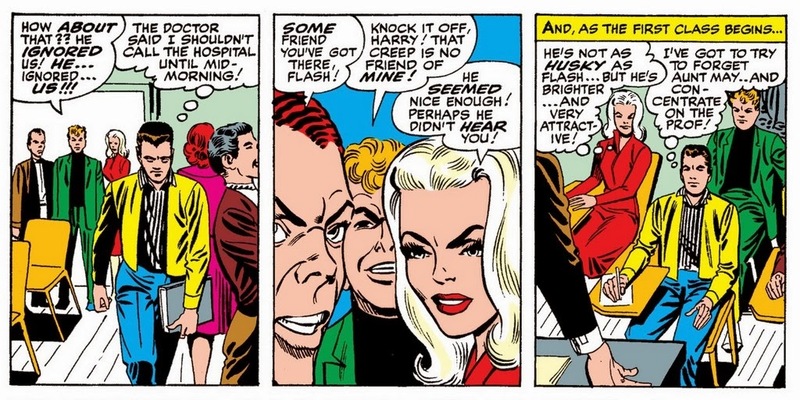 Now, to bring this all the way back around full-circle, a lot of readers that don’t prefer the character of Gwen Stacy as a love interest, like to reference the years she spent as a constantly crying drag of a girlfriend. While that interpretation is certainly valid based on some of the comic books she appeared in (Stan Lee certainly got in a rut with the character, which I also like to chalk up to the overall depiction of females in comics at that time) that is not the way I choose to remember the character. My personal continuity is dominated by the feisty and sassy bombshell from the very first Steve Ditko–drawn appearances of the character. In Gwen Stacy’s very first appearance, she’s hanging out with Harry Osborn and Flash Thompson on the first day of college. Peter Parker, distracted by his ailing Aunt May, snubs the trio, which will cause him nothing but trouble in the days to come. Gwen tries to give him the benefit of the doubt, even noting how bright and attractive she finds him. Harry and his crew want to play a prank on Peter in chemistry class, using Gwen as a distraction. Gwen reluctantly plays along, but storms off in anger when Peter pays no attention to her. The next day, Peter is still distracted, but Gwen still wants to believe he’s a decent guy deep down. 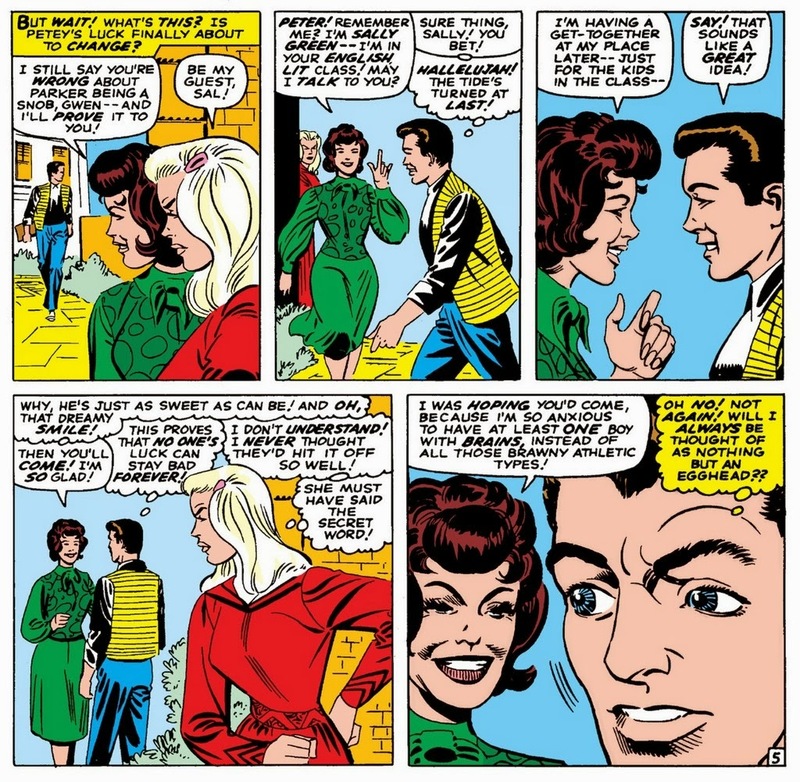 Later on, Gwen tries to approach him once again (along with the immortal line “Peter Parker is the only boy I’ve met who hasn’t given me a tumble”) but is spurned once again. 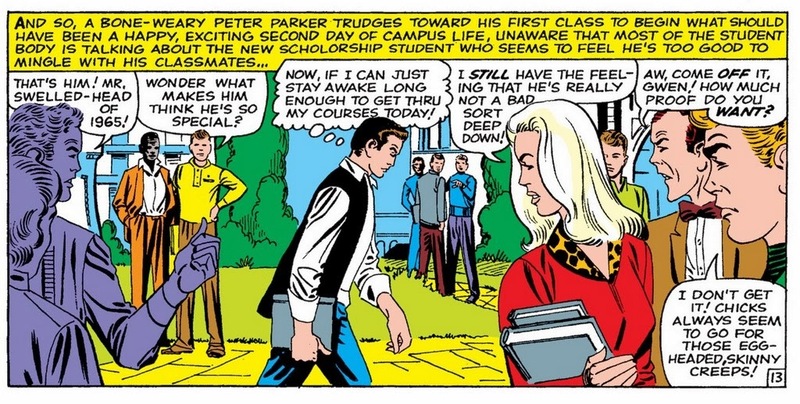 Days and issues later, having finally saved his Aunt May from death, Peter Parker can finally attend class without distraction. 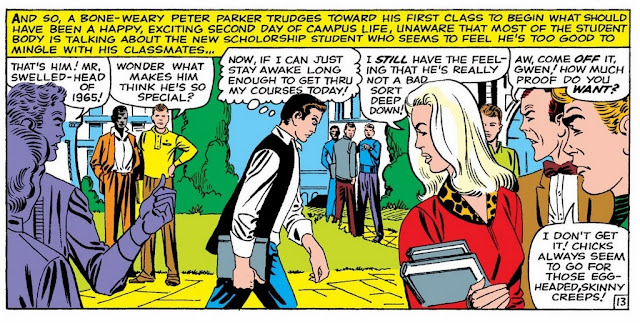 He’s confused to discover that he’d already long burned the bridges of his new classmates, to include the beautiful Gwen Stacy, who has every guy on campus drooling over her. 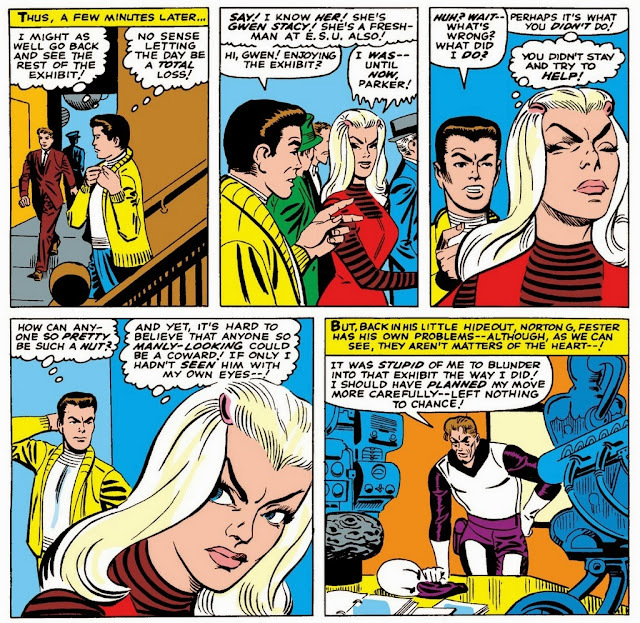 Gwen still is intrigued by Peter, but gets angry again when he won’t even give her a cursory glance in chemistry class. 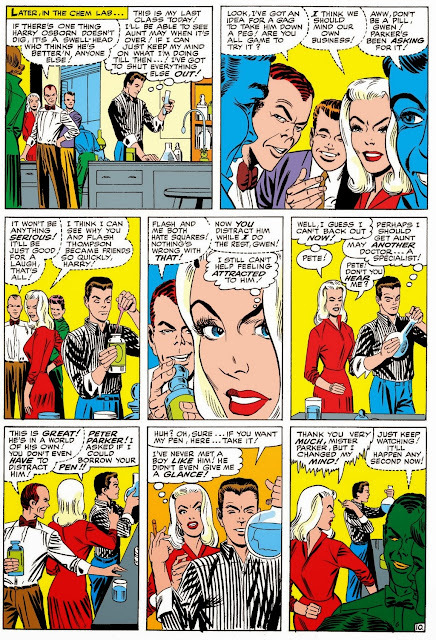 Later on, Gwen’s friend Sally jumps into the fray, inviting Peter to party at her place. This confuses Gwen even more, as she has had no luck getting him to pay attention to her thus far. Unfortunately, Sally says the wrong thing, leading Peter to give her the brush-off. 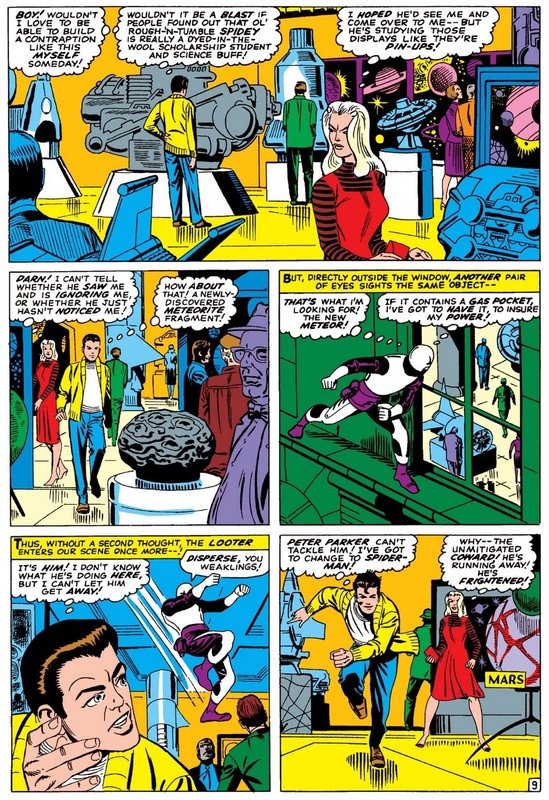 In Amazing Spider-Man #36 (incidentally the only Steve Ditko issue of Spider-Man I had as a kid, I was so pleased to have such an old comic, and it was one of his worst) Gwen spots Peter at the Space Exhibit they are both attending. Unfortunately, Peter never spots her, frustrating her yet again, and then she thinks him a coward when he runs off to change into Spider-Man. After fighting off the menace of Norton G. Fester, Peter finally spots Gwen and tries to engage, but she is already disgusted by his cowardice. 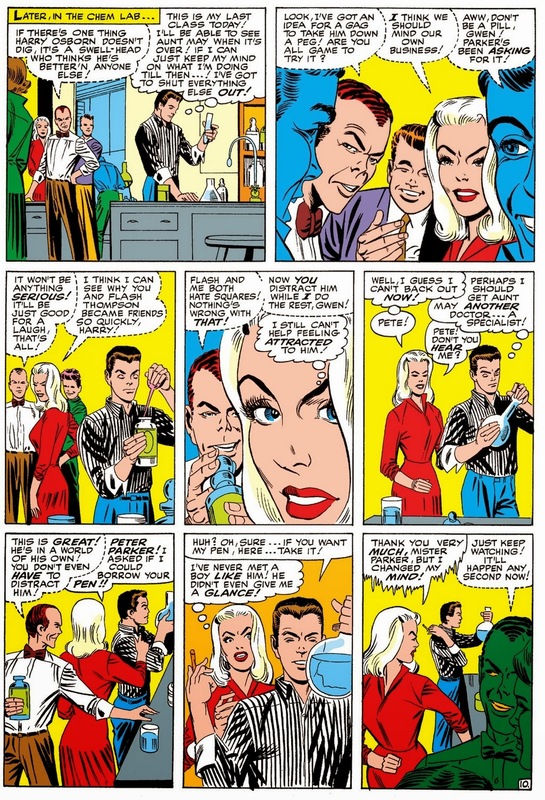 After that, Gwen is in full on hate mode, mocking Peter for his seeming lack of physicality. The next time they cross paths would prove to be the most significant to date, as Peter and Gwen would angrily flirt with each other for the first time. So far Peter has represented the only boy that has shown no interest in her, and doesn’t praise her with every word. 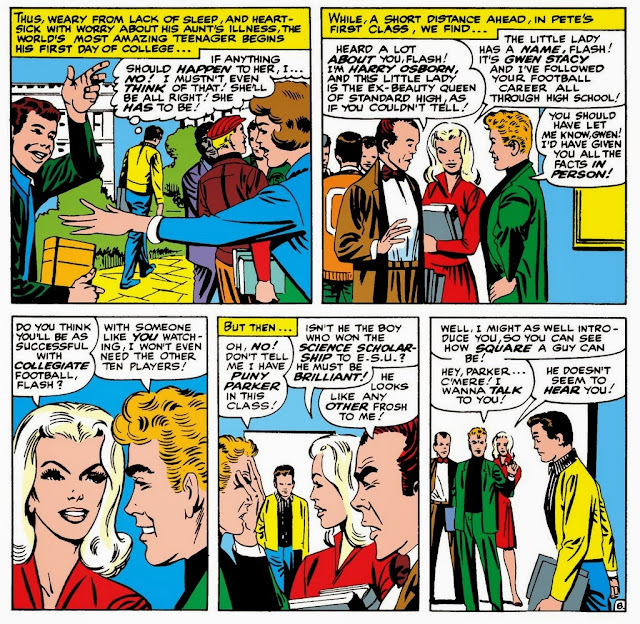 Peter dismisses an intervening Flash Thompson like the nuisance he is, impressing Gwen to the point that she even starts defending Peter to Harry. Next time out, John Romita Sr has taken over as penciller of the book, and we get our first glimpse at his definitely more attractively drawn Gwen Stacy. It appears Gwen has finally convinced them all to play nice, but unfortunately Peter is lost in his head again, and he misses his first chance to become a part of the group. 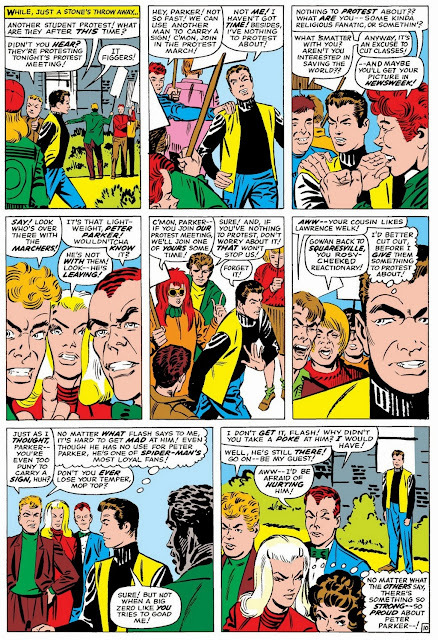 Peter makes his first inroads to becoming a part of the group in the most honest of ways, genuinely consoling Harry, who was upset over his relationship with his father (the aforementioned soon to be revealed Green Goblin). Gwen is practically ecstatic about the prospects. Even Flash begins to wonder if he’s been wrong about Peter all this time. Who would have guessed that a genuine act of kindness toward Harry Osborn, would wind up being the spark that led to Peter and Gwen falling in love. After that, Gwen and Peter’s relationship would advance into dating, love, and total commitment. Peter’s life as Spider-Man would always be pulling him away, leading him to danger, leaving Gwen left behind to cry or lament over her absent love. Unfortunately, before Stan could realize this was happening way too often, it became an annoying character trait, one I choose to ignore. The trend was eventually broken, and Gwen became a much more dynamic character again. Almost too much, because with her interesting again, and the relationship going so well, there was only one way for it to go next, and that was marriage. Great discussion. It was a neat trick to have Peter's joy at starting college disrupted by Aunt May becoming so sick and that sickness caused by the radioactive blood Peter had donated to her earlier. Naturally, Peter was very distracted by concern and guilt and too anxious about finding a way to save May to be concerned about making a good impression on his new classmates, never mind his old high school nemesis. 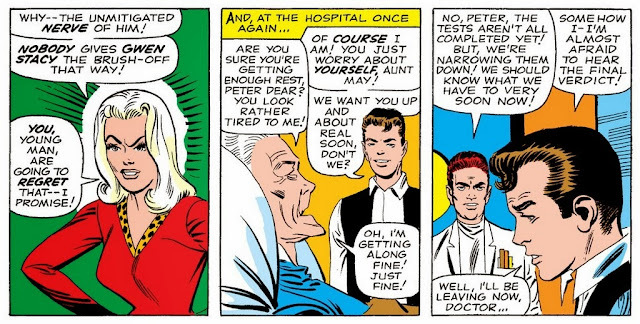 Then there was Peter's tendency to be secretive and bullheaded, declining to tell anyone about his sick aunt even if that might make them more sympathetic to him. On Stan's part, this was great melodrama, but I also think it came as much from Ditko's personality and reclusiveness. I have read that to a large degree Ditko based his depiction of Peter Parker on his own younger self. It is a bit amusing that an artist whose most famous co-creation made his living as a photographer has not allowed anyone to take photographs of him for over 50 years. The biggest change after Romita took over as artist was that almost suddenly Peter and most of his supporting cast became noticeably nicer, with Peter reacting to Harry more like a noraml, caring person than with his previously all too common sarcasm. I loved the stories from the Ditko era but Peter and his classmates were becoming pretty unlikable by the end of his tenure. 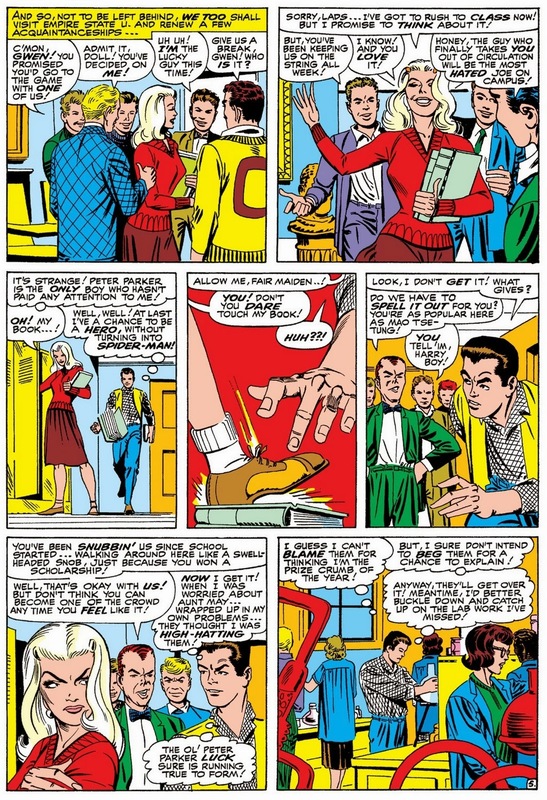 If Ditko had stayed on, would he have had Peter and Gwen seriously connect as they did under Romita? Notably, over in Dr. 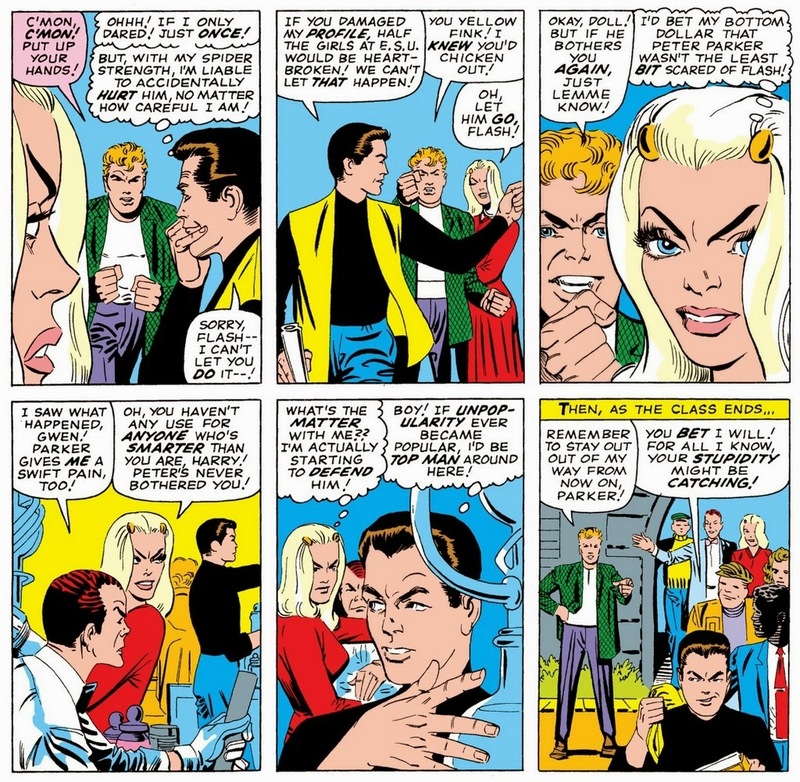 Strange, Ditko leaves the Master of the Mystic Arts clearly smitten with Clea, just as Peter was clearly smitten with Gwen, and although Gwen is shown as furious at Peter for his behavior she also seems very much intrigued by him. Ditko departs both strips with romantic possibilities for the protagonists up in the air. Admittedly, in Marvel's early years, nearly every hero had significant romantic frustrations, although by 1966 Stan was edging away from the more cliched tropes, having married Reed & Sue the year before, having Jane find out that Donald Blake and Thor were somehow one and the same and then swapping her out for Sif being among the more significant developments.